Hi, my names Erik. I just picked up a very neglected 73 Celica ST. Its basically a complete shell with no drive train or front suspension. The guy I bought the car from did a lot of body work to it and got the car pretty strait, but he found a cleaner shell and moved on to that. I've got a lot of experience with old Datsuns and AE86s, but this is my first Celica, so go easy on me if I ask a lot of stupid questions. Hello Mog and welcome to the community! I started off like yourself here and quickly learned that there are no stupid questions when dealing with old Celicas, just means to an end. The people here are helpful and experienced in various areas of the Celica so ask away. Be ready for some quick replies but also sometimes you may get a reply in a couple of days depending on your question. Connections are made with members that may be just around the corner, you never know! 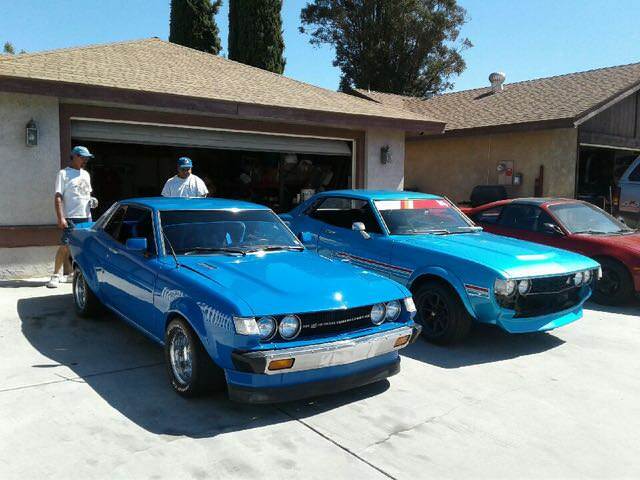 I met up with member Castillo77 who lives just 2miles from me and we have been in this area for many years not knowing our Celicas were so close. Now we help each other out when we can so its a good thing you included your location, someone should be close to you. Mine on the left, Castillo on the right.